It's Friday, and today it's time for some midway inspiration on the Aloha Friday Challenge blog. This time, the theme is Winter Blues. One of our sponsors is Scribbles Designs. I loved using this Wintertime Subway Art! I was able to create a very fast card, simply printing the Wintertime Subway Art, adding a bit of color, then adding some die cuts. The background paper is from We Are 3. It is from the newly released Snowmen paper. The snowflake banner is from La La Land Crafts. I don't know who makes the deer die cut. I've had it for quite awhile. The Winter Blues challenge goes for another week at Aloha Friday Challenges. I hope you can join us! Link up through next Thursday, January 24! I love this subway art! 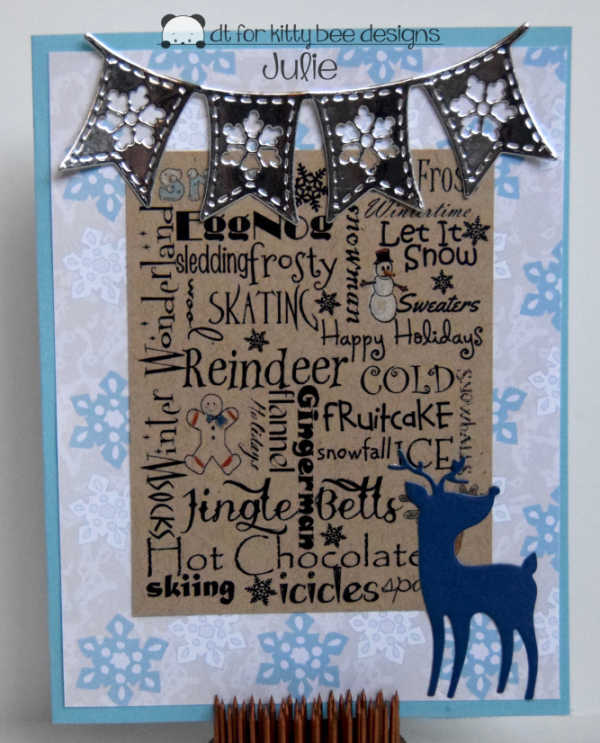 Beautiful reindeer card, Julie! I've never seen that embossing folder before, and it is the perfect panorama for your deer to bring all things Christmasy to the recipient! That darling little banner is ultra sweet! So glad I got to see your critter project showcased at the 2 Crafty Critter Crazies Challenge. Hope to see more of your creations in the future. Please check back to see if you are a winner or A Designer Favorite. Sending you wishes for a wonderful day! It's Party Time! at Bugaboo Stamps!